The Mews01263 715779work01603 870304fax Self-cateringThe Mews is a charming single storey conversion of the coach house and stables which were formerly part of Monteagle House. It provides pleasant and spacious accommodation in a superb location within Wells-next-the-sea. • Other: Bed linen, books, games and CDs provided. Towel hire £7.50 pppw. Please note: some internal steps so may not be suitable for anyone with mobility problems. No children under five. The Mews offers weekly bookings starting on Friday. The Mews is a charming single storey conversion of the coach house and stables which were formerly part of Monteagle House. 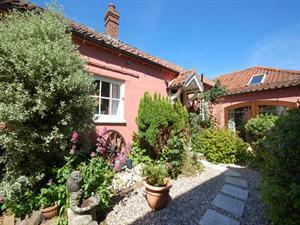 It provides pleasant and spacious accommodation in a superb location within Wells-next-the-sea.